A manhole explosion Monday afternoon on Wall Street prompted a building evacuation, fire and utility officials said. 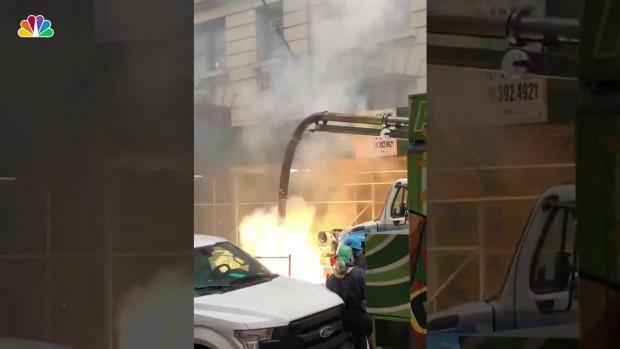 The FDNY said it received a call about a manhole fire at around 3:05 p.m.
Con Edison crews are currently on site, according to utility spokesman Phil O'Brien. O'Brien said the fire caused a partial power outage at 82 Wall St. The building has been evacuated. A witness captured this footage showing a smoky, explosive fire on Wall Street Monday afternoon. It is unknown when power will be restored, O'Brien said. In video posted on Twitter from the scene, a cloud of heavy, gray smoke can be seen coming from a manhole as live wires sparked, creating what sounded like explosions. The street is currently blocked off.